Hi crafty friends! 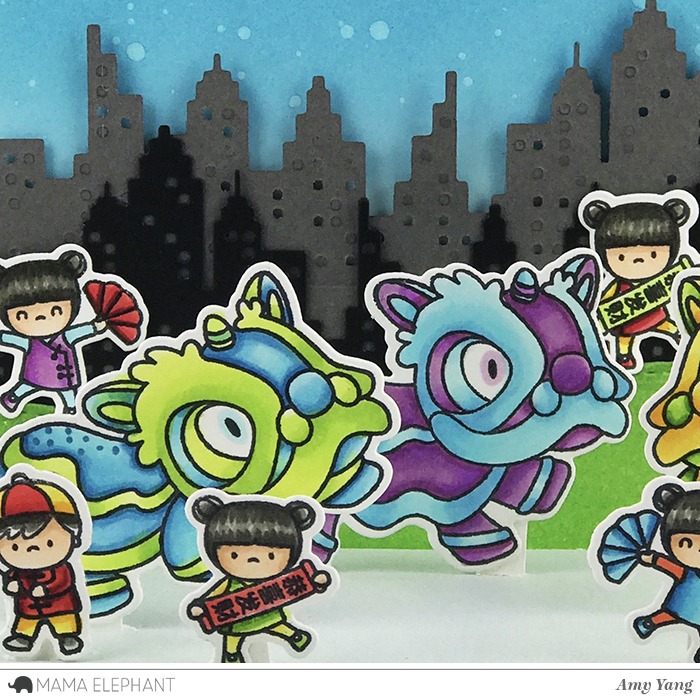 Amy here, and today I have a fun floating floor pop-up card to share with you featuring the Lion Dance stamp set. 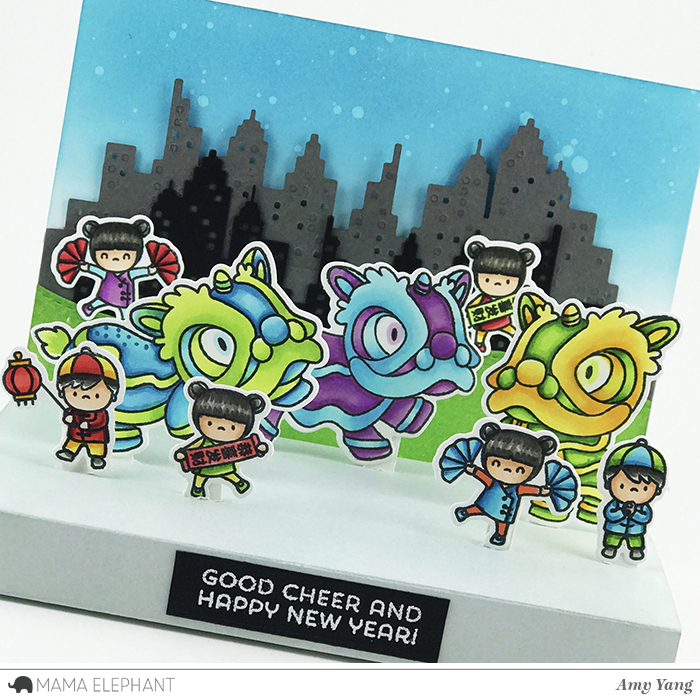 The card depicts a colorful and festive Lunar New Year celebration, with the Lion Dance. To begin, I colored the images from Lion Dance with Copic markers and cut them out with the coordinating Creative Cuts. I made my card base by trimming Bristol paper to 5 1/2" x 8 1/2" and scored it at 4 1/4". To create the sky, I inked the front and the inside of the card base with Salty Ocean Distress Oxide. I die-cut Bristol paper with the hill borders from Landscape Trio Creative Cuts to be used for the front and the inside of the card. I used Mowed Lawn Distress Ink and Peeled Paint Distress Oxide to ink blend the hill panels. I added splatters of water to the ink blended sky and the hill panels to add texture. I die-cut gray and black cardstock with the Cityscape Creative Cuts. I adhered the Cityscape panel (for the gray one I have the back facing front) and one of the hill panels to the inside of the card. Then, I adhered the other hill panel to the card front. To make the floating floor, I trimmed light gray cardstock to 5 1/2" x 4 1/2" and scored lines at 1/2", 3 1/2" and 4". I trimmed 1 1/2" long and 1/4" wide strips and folded them to an L shape. I laid out the images as shown on the floating floor, and used a craft knife to make the slits a little wider than 1/4" wide right underneath the images. I folded at the scored lines and adhered the floating floor as shown and inserted the L shaped strips into the slits (the bottom of the L gets taped to the card base). This allows the images to pop up when you open the card. Then, I adhered the images to the strip, trimming it if it was too long. At this point, I adhered the other images to the card front. The sentiment was stamped with Versamark ink on black cardstock and embossed with white embossing powder. I adhered it to the front of the floating floor. That's all for today! Thank you for stopping by, and happy card making! Fantastic!! Super vibrant, bold, beautiful, colorful and fun creation!! Wow, this card is sooooo magnificent!!! I love the way you made it 3D and the colors are so bright and lovely. Great job!! !